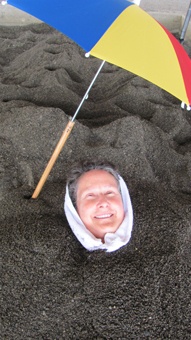 Anna Udagawa (here enjoying a naturally hot sand bath at Ibusuki) was born in Sussex. After graduating she worked at the BBC in London before heading off to explore the world, gradually travelling further east. She went to Japan initially to visit a friend but was soon inspired to prolong her stay, working in Tokyo and also Yokohama as an English-language teacher. She met her future husband in Japan but after getting married they came back to Britain. However, Anna returns whenever she can.